The Ferruginous Hawk, also known as the Ferruginous Buzzard, is an impressive looking bird with a stout body and an impressive wingspan, which can reach over four feet in length. These birds have a grace and beauty that is common among the hawk family. 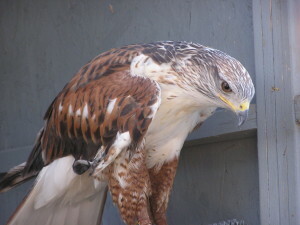 The Ferruginous Hawk is used less often in Falconry than others, such as the Harris Hawk, due to the Ferruginous being more temperamental and harder to handle. It is far from impossible, though, and is considered by some to be good experience for those falconers who aim to someday train eagles due to their similar size. 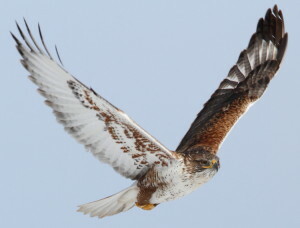 The Ferruginous Hawk is considerably larger than the Harris Hawk and is well suited for catching larger prey. 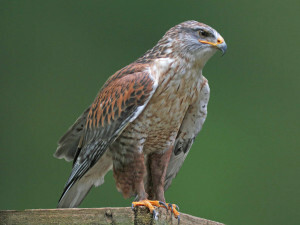 There are generally two color variations (or morphs) for the ferruginous hawk, the ‘light morph’ and the ‘dark morph’. The darker of the two is a dark brown to cinnamon in color. The exceptions to the solid color being a white patch on the top of the wing and a yellow stripe by the beak. The lighter of the two variations generally gives the bird rust colored backs and shoulders. bird’s underside is white with either spots or streaks. This pattern generally gives the bird a white tail tipped with a pale rust color. The name Ferruginous literally means rust colored. 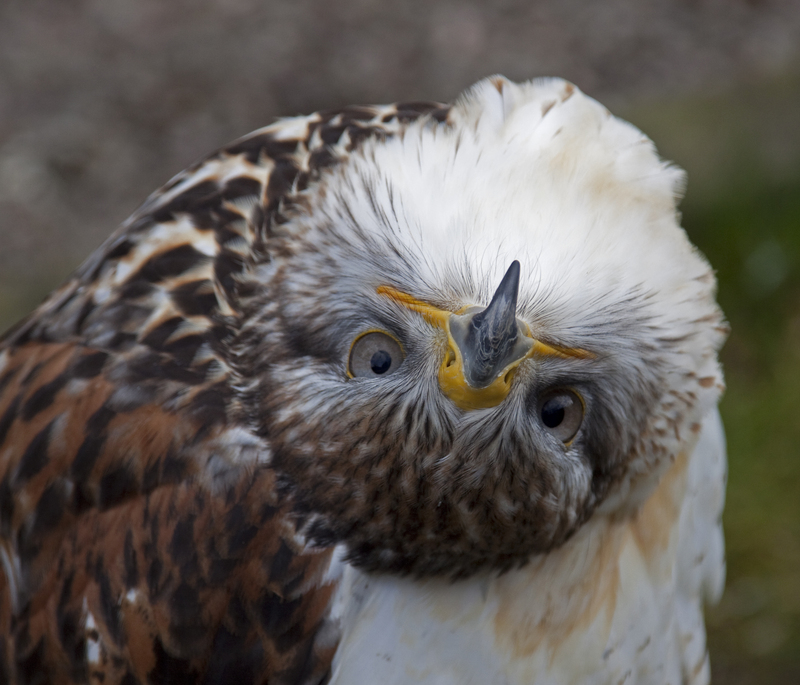 Arguably the largest bueto in North America, the ferruginous hawk has an average length between 22 and 25 inches, with a wingspan range generally between 53 and 56 inches. The females are often slightly larger than the males up to an average of three point six pounds (1,231 g) versus the three point one pound (1,059 g) average for males. 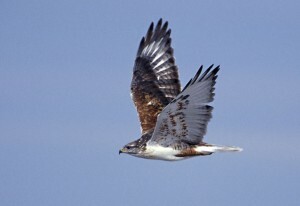 The habitat for the Ferruginous Hawk generally consists of open areas, such as grasslands and arid zones in the northwest, though they’ve adapted to living in mountainous regions as well. Their natural range extends over much of North America’s western reaches, from the southern reaches of Alberta and Saskatchewan, Canada to as far south as Baja and central Mexico. They’ve also been known to pass threw the southeastern United States during their migration. Their diet includes many types of animals, including gophers, prairie dogs, voles, white tailed rabbits, jackrabbits, mice, rodents, snakes, lizards, meadowlarks and grasshoppers. The main bulk of their diet will vary from location to location depending on availability of the food source. 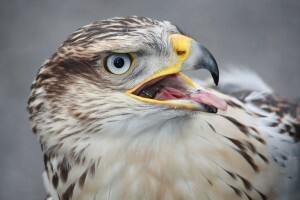 Hunting techniques include waiting on the ground for prey to immerge from its burrow, diving onto prey from an altitude of up to 300 feet, low altitude strikes and taking after prey from a perch, though ground hunting seems to yield the best results for this hawk. These hawks often prefer to hunt in early morning or late afternoon. Another interesting fact about these birds is the proximity to their home territories they will allow other birds of prey. They will often permit others of their own kind within ½ mile of their nest. Sadly, the loss of habitat seems to be an increasing problem for this species. This problem is only made worse by the fact that human activity can be very distressing to these hawks in the wild, especially during nesting season. As falconry is a controlled hobby in many countries, please consult applicable government agencies with regards to licensing. Even if it is not strictly controlled in your country, falconry requires great knowledge of the animals you intend to care for. It is important that potential falconers apprentice and learn as much as they can before bringing a raptor into their care. In general, Raptors do not make suitable “pets”. Life in a cage is not a suitable life for a raptor, they need to be flown and hunted. 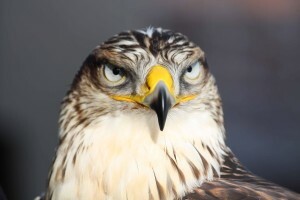 For more details on falconry in general, please read see the stories section on general falconry. The Ferruginous Hawk has been known to build nests that tend toward the massive side of the scale. Preferred nest sites include rocky outcrops, hillsides, rock pinnacles, trees or right on the ground. When the nests are built, the male will collect the necessary materials while the female does the actual building. Building materials include twigs, grass, small bones, and cow or horse manure. Breeding pairs have been noted as having up to five such nests within their territory, but only one is used during the year. When the Ferruginous lays a clutch, it’s often between the months of February and July. These eggs are white with brown speckles and are laid in a clutch of three to four eggs, with a period of about two days between each egg being laid. The incubation period can last up to 32 days, with both parents getting involved in the process. The newly hatched youths will act as fledglings for 38 to 50 days, depending on age, size and gender. Once graduated from fledgling status, the young hawks have been known to stay with their parents for periods of up to 40 days before leaving to start a life on their own.